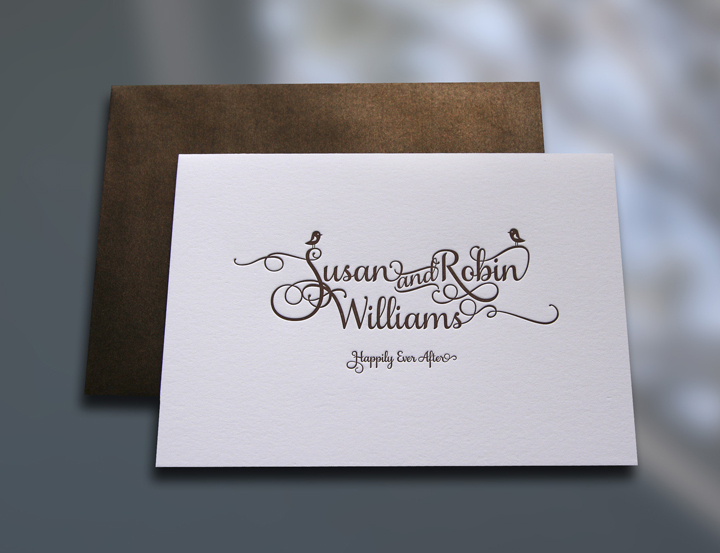 Last fall Sky of Blue Cards had the great honor and amazing opportunity to design couture note cards for über-adorable celebrity newlyweds Susan and Robin Williams (yes, that Robin Williams). 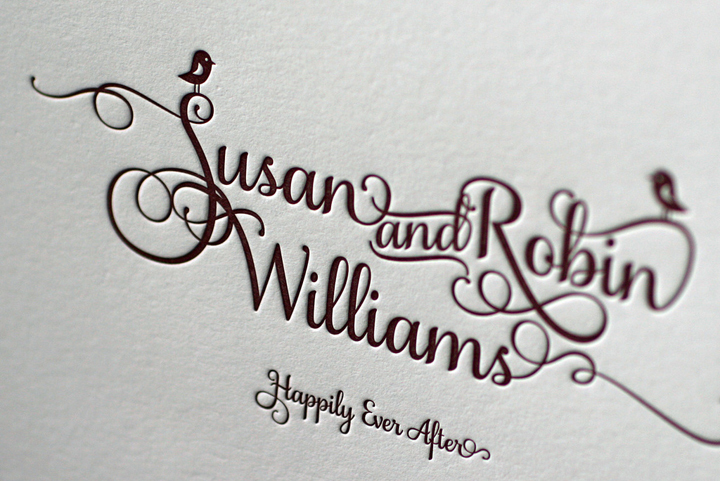 Susan and Robin were recently married and what better time is there to get custom stationery than when you are beginning your life together? I wanted their cards to exhibit everything they are: fun, funny (obviously), beautiful (she’s drop dead gorgeous, by the way), kind, and mostly – deeply in love. 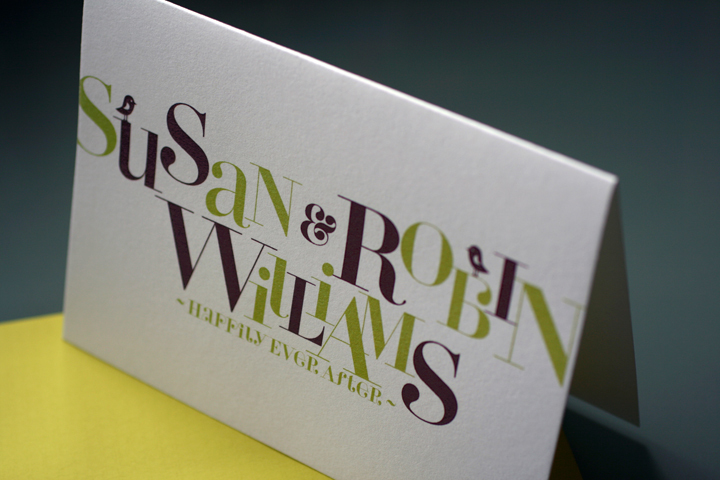 If ever there were two people who belonged together, it’s Susan & Robin. I had two designs which I had created for them and I loved them both. I could not decide which one to go with, so what the heck – I had both of them printed up. 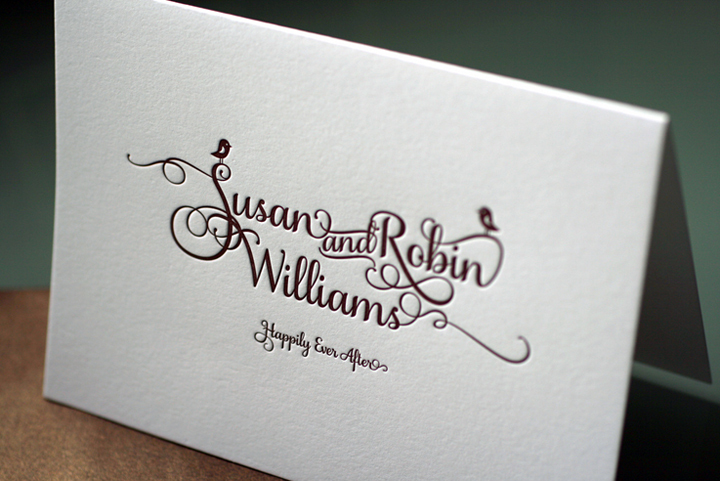 My personal opinion is that the 2-color is “Robin’s” and the 1-color is “Susan’s”. Susan says they love both of them. The above photo is of the one-color letterpress card, 7″x5″. The paper is Crane® Lettra, 110#, in fluorescent white. The text is set in “Samantha Script” (Upright Pro & Swash) with the “and” set in “Samantha Catch Words”. I had way, way, way too much fun with the Glyphs palette on those swashes. Way. Too. Much. Fun. This card is printed with Pantone 483 brown ink. (Most who are familiar with my designs know I’m in love with that particular brown.) Their A-7 envelopes are 80# text/120gsm Pearlescent Bronze and they look beautiful with the cards. This card is elegant, chic, and call me crazy, but with all the swashes intertwined the way they are, it just makes me think of their love and their life, now fully blended together in matrimony. Lastly, you’ll see two little birdies gazing lovingly at each other… what could be better? Above is their 2-color note card, 7″x5″. It’s offset printed on Crane® Lettra, 110#, in fluorescent white as well. The colors are Pantone 483 brown & Pantone 584 lime-ish/green. The text is set in one of my favorite fonts, Perla (Alternate & Regular). The corresponding A7 envelopes are an absolute perfect match – Eames Weave in Tivoli Green. The chunky, woven surface texture of the envelopes make a happy match with this lovely card. This one also sports two of my signature birdies. 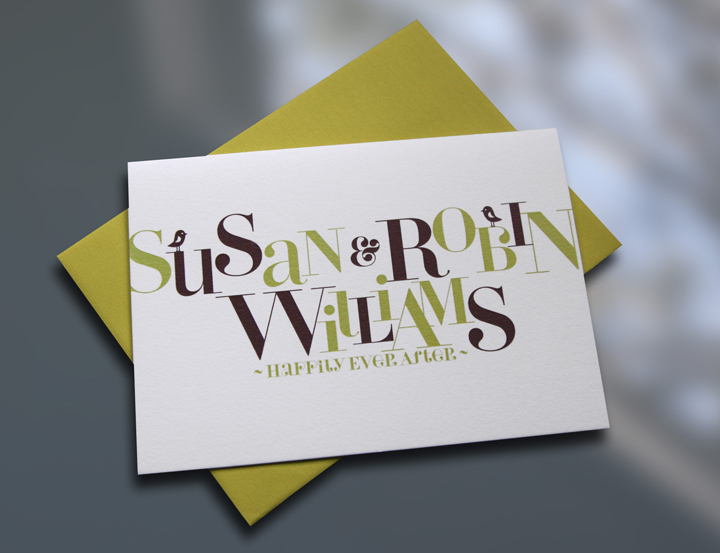 It was such a wonderful experience creating these cards, and I want to wish Susan and Robin a lifetime filled with love and bliss… happily ever after. All the beautiful photography you see here was done by the fabulous Darilyn Kotzenberg, of DK Design Studio.